The bags are filled with school and personal care items for children living in third world countries. The bags are woven and painted by volunteers in India and made available to CLWR who, in turn, distributes them to individual congregations. In the fall of 2017, we forwarded 49 kits of educational supplies. Our enthusiastic parishioners purchase the items for the “Learning and Living Kits” and the Community Outreach Committee packages the shipment for return to CLWR. 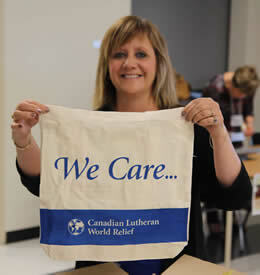 The boxes of We Care Bags are shipped free of charge to the CLWR office in Winnipeg by Home Hardware. The $5.00 that is included with each bag is used to assist CLWR in shipping the bags to a developing country. For further information about this worthwhile project please contact the Community Outreach Committee by calling the church office at 780.416.9594.